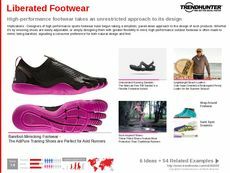 Find Better Ideas, Faster ® with a custom moccasin trend report, our PRO Dashboard and 80+ categories of premium trend reports. The Moccasin Trend Report examines how this cultural footwear style is gaining mainstream popularity within the fashion world. Both men's and women's designs are appearing in the style of hybrid moccasins that result in moccasin-style boots, summer sneakers or even dress shoes. Leather, suede and fur are often included, while beading or embroidery can make for a bold design detail. A rise in sneaker collaborations has resulted in many co-branded designs as well as DIY creations. This is an insightful report for fashion designers, bloggers and magazine editors. 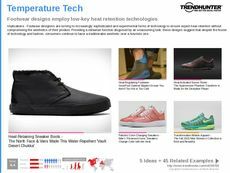 Specifically, shoe designers can gain inspiration from traditional moccasins to create modern updates that are popular with contemporary consumers. Designers in areas other than footwear can also draw inspiration from this report, as they can reference trending materials, styles or visual elements from moccasin styles. The Moccasin Trend Report showcases the popularity of these comfortable leather shoes and outlines their design appeal to consumers.